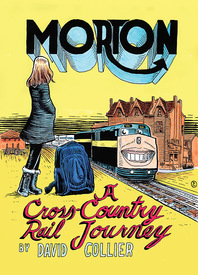 It's time to let the good times roll - with MORTON! Let's all join David Collier on a cross country (in this case, Canada) rail journey and experience old school reality before it slips into the history books. We will be conveyed along our journey by train, the most civilized form of travel. We will experience the journey via comics, the most suitable form through which to communicate such an undertaking. And our pen & ink guide will be David Collier, who intuits the precise perspective.